Before the worship, we briefly meditate on what we’re, what attitude, what worship is, and what attitude we should have, and then what kind of heart does God really desire from us? I think the heart that God receives from us is a broken heart, brokenness. Humble brokenness God will never despise. God will see that broken heart with mercy and grace and that is the part that gives true worship to God. Today, I’d like you to picture this particular verse, verse six. I gave my back to those who struck me and my cheeks to those who pulled out the beard. I did not hide my face from the insult and spitting. I want you to look at that scripture passage and then think about it. If you put yourself into it, how would you feel? It is a troubling picture in a way. I see a totally helpless victim and we don’t like this kind of picture. If people strike us, we strike back so that they will never strike us again. If people insult us and spit at us, we will not just take; we will retaliate. We believe that that is the right thing to do, but is there anything that we can learn from what we just read? When you look at the picture very carefully, you will be able to see what Jesus went through. That was exactly what Jesus went through. That is what the cross it looks like. Is there anything that we can learn from the cross or there’s nothing to learn from the cross? The Cross can be very dangerous in a certain sense. When people hit us, abuse us, and insult us, they destroy our self esteem, dignity and self worth. Our core self is attacked. That’s why it is painful. That’s why we people react and retaliate because they want to protect that inner self, the core self that holds us together. Otherwise, we’ll collapse. I find people very difficult. That is the most difficult thing to deal with. The people or the most difficult thing to deal with. I mean all the hard work and that’s fine, but people are very difficult to deal with. People can be selfish and self centered and people are very unpredictable. One day they are very good, but the next day they are totally different. Are they the same person? We wonder. People give us the greatest joy, but at the same time, they give us the deepest pain. Because of people we laugh, but also because of the people we cry. People are difficult to deal with and also people can be quite cruel at times. When their hearts are closed, they can be quite cruel. When we look at the way they killed Jesus. We can see how cruel human beings can be. From human cruelty, even God’s son was not spared. To this image shows us the cruel image of human beings. They struck, pulled out the beard, spat and insulted. I once witnessed on the street to a person actually beating another person. You ask the cruellest scene where the face he punched and the other guy fell down on the street and he went and then kept punching at him. When I saw that, I was so disturbed by that scene. That’s a cruelty. Not only are our people cruel, but also they’re very ignorant. They don’t know what they’re doing often. They don’t even know how much they hurt other people. That’s why Jesus on the cross said, Lord, they do not know what they’re doing, but Jesus asked for God’s forgiveness for them. That’s a miracle. That’s amazing! and he’s on the cross. They were nailing him on the cross and then Jesus was thinking, they don’t know what they’re doing. Forgive them. That’s the very hard thing to do. How nice it will be if he can be a warm and loving presence to people around us, how nice it will be if you can give them joy and hope. How nice that will be. If my presence can give some joy and hope to other people, that’s a wonderful thing to do, to be, but we’re not always, we know that. Many times we hurt others; cause pain in them and make them angry, especially to those near us around us and that pain is so deep that is hard to overcome. That’s why we need to always humbly discipline ourselves so that we know what to say and what not to say and be always considerate and show kindness to whoever we meet and that is a right thing to do as a human being to those people who are strangers, we need to be considerate and kind. We should not say hurtful things about people. Even though we try so hard still, we make mistakes and hurt others unconsciously, and how much more will hurt other people if we live mindlessly? We just act out our emotion. How much we will hurt other people. Even if we discipline ourselves is so hard not to hurt other people, but if you just behave like you feel like it, how much more you will hurt other people. Not only do we hurt other people, but we also get hurt by others. We don’t remember well the pain that we caused in others, but we remember vividly the pain we received from others. There is no hurt that is not painful. It doesn’t matter how small, maybe all the hurts are painful, maybe or hurt often ourself that is deep within gets wounded. When we are hurt. we feel like I’m nobody. They make me feel that way. When you heard they feel like I’m a pitiful an existence. Our dignity gets crushed and our self-worth is taken away from us and we get thrown into the deep darkness and we even doubt about ourselves. Our damaged itself, distorted image and the dark shadow will torment us and we get angry and we lose ourselves. That’s why the cross is dangerous because you lose yourself if you’re not careful. They tried to get rid of anything beautiful from Jesus. He could not just kill Jesus. They had to kill you just as a condemned person. They did not just want to kill Jesus. They wanted to condemn Jesus and let people know that he died because of his own curse. That’s what they wanted to do. They trampled on Jesus integrity and took away any importance left in him. That was the cross. Most of us maybe we actually experienced the cross will get devastated, will be devastated. Will not be able to survive. A lot of us will lose ourselves. We may not be able to stand up again once we experienced that kind of cross in our lives. Somehow, Jesus was different even though people try to take away dignity from him. He had that dignity intact. He was confident. He didn’t lose himself. He did not bow down before their insults and humiliation. They took everything from Jesus, but they cannot destroy the soul. They took away everything from Jesus and they crushed everything Jesus said, but they cannot destroy the soul, the core existence of Jesus. I think the key is verse 8 and 9. When we read again verse 8 and 9, it shows us why he was able to have that confidence. He who vindicates me is near. He is God. Who will contend with me? Let us stand up together. Who are my adversaries? Let them confront me. It is the Lord who helps me, who declare me, who will declare me guilty. 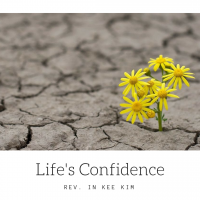 He had confidence in God. When you have confidence in God, you can have confidence in yourself and no one can crush you. Once we have confidence in God, no one can take away your dignity. We don’t get. We won’t get affected so much by what people say to us, about us. How people treat me is not the most important thing that we worry about anymore. We don’t get affected by what others do to us anymore. We can be confident and strong. As we live our lives. Yes, we meet all kinds of people. The thing is we cannot change them. Can you not expect them to be changed? Well, we can continuously get hurt and when your soul is damaged by them, that’s not right. We need to build the core in our identity and I think that’s what God can give us, when we have confidence in God, even though they may hurt us, they should not destroy. They will not be able to destroy our soul. The world condemned Jesus as being wrong, but Jesus’ resurrection prove the world wrong. God knows us and when we have confidence in God, we can embrace people’s criticisms. That’s hard. That’s hard, but when we have confidence in God, then we can embrace people’s criticisms. If there is something wrong with us that we repent and change, but if they misunderstand me, even that we can embrace their misunderstanding and we can move on with life. We can on with life. We don’t live anymore by what other people say about me or how other people treat me. I have my way because God gives me that confidence. Don’t ever forget that you are beloved, beautiful children, children of God. Instead of reacting to our situations and to what people do to us, we live with confidence in God and in ourselves. Don’t pay evil for evil. When we have confidence about God, we don’t need to pay evil for evil. We will pay evil for good. That is the power of the cross and will serve without a feeling of pity. We will serve others and love others with confidence. That’s what Jesus did. That is the power of the cross. They can not humiliate me anymore.